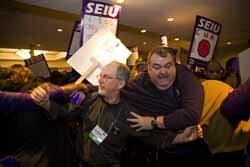 SEIU protesters attempting to storm the banquet at the 2008 Labor Notes Conference. Photo: Jon Flanders. 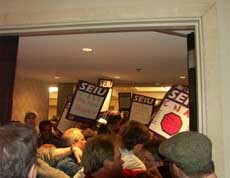 As the 2008 Labor Notes conference banquet was beginning 200-300 chanting SEIU members and staffers rushed through the side door of the hotel, nearest the banquet hall. The doors had apparently been opened from inside by SEIU staffers attending the conference (see below). Most were wearing the signature SEIU purple T-shirts; some carried signs denouncing the California Nurses Association. CNA Executive Director Rose Ann DeMoro had originally been scheduled to address the banquet, although her cancellation had been announced earlier in the day. About 15 conference participants were acting as security at the banquet hall doors. When the chanting protesters entered, waving noisemakers, they and others quickly formed a double line in front of the doors, linking arms to block the way. Some participants were thrown to the ground by larger SEIUers. One protestor broke through the first line and, finding himself trapped between the two lines, flailed wildly. Former Labor Notes office manager Dianne Feeley, a retiree from American Axle, was pushed and fell, cutting her head, and was treated at an emergency room. Protesters continued to try to advance toward the doors, some nonviolently and others more aggressively. Hotel security and Dearborn police eventually made their presence felt. They made no arrests. After chanting “we’ll be back,” the protesters returned to their buses (according to hotel security there were six buses). Earlier, a number of SEIU staffers had disrupted workshops by heckling and attempting to shout down speakers from the CNA or its affiliate the National Nurses Organizing Committee. 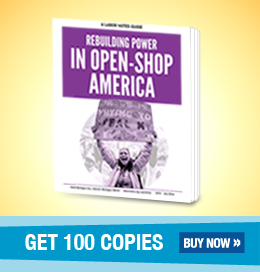 SEIU and CNA have long been at odds, often in direct competition to represent the same workforce and disagreeing vehemently over single-payer health care legislation, labor-management partnerships, and neutrality agreements that allow a union to recruit members without employer opposition. Their latest skirmish was over health care workers in Ohio. Shortly after protesters left, SEIU’s national leadership issued a press release titled, “SEIU Members Stand Up for the Future of the Labor Movement and the Interests of All Workers.” SEIU Vice President Mary Kay Henry praised the demonstrators. It is important to note that SEIU’s planned disruption would have frightened and intimidated hundreds of union members who are not party to their dispute with CNA. In the crowded banquet hall, in which there was barely room between tables; in the panic people undoubtedly would have been injured. As it was, the entire waitstaff, members of UNITE HERE Local 24, fled. We are grateful to the conference-goers whose quick thinking managed to keep the protest contained. Labor Notes welcomes debate on any and all issues facing the labor movement, both at our conferences and in the pages of our magazine. But that debate must take place free from intimidation. The SEIU International is not the first union to protest at our conference. But in our 29 year history we have never had a group of protesters storm our conference, or assault the brothers and sisters who attend it. Neither intimidation nor violence has a place within our labor movement. Whatever the original intent, bringing hundreds of people to behave in a confrontational way towards a union that leaders have branded as the enemy was bound to result in violence. Such actions cannot help the labor movement to grow. We call upon the officers of SEIU to repudiate such confrontations. Labor Notes is a monthly magazine and education project that since 1979 has been a center for communication and inspiration for rank-and-file union members and labor activists. Labor Notes publishes the only national independent cross-union monthly by the same name. Subscribe to Labor Notes for $40 for two years (24 issues) by going to www.labornotes.org/subscribe.